I’m asked this simple, and completely reasonable question, often, and it always gives me pause because I know that the answer - “it depends” - won’t be enough. I get it. Really, I do. I help smart people, like you, build content marketing strategies, and I know you understand that content marketing is a journey. But, knowing that content marketing requires patience and actually feeling patient is not the same thing, especially when other priorities are competing for your time. If you could get some sign - any sign- that you're on the right path, it would be so much easier. This is exactly why you need a content marketing strategy. Examining your reasons for creating content and using that information to prioritize and guide your work is like getting fuel and a map for your journey - a map, with checkpoints, so you can track your progress and make adjustments along the way. In this post, we'll take a look at a few components of a content marketing strategy, and discuss how each can help you drive results - and what you should expect. Whether you’re building a content marketing strategy in-house or working with a consultant, you'll first go through a discovery process. In this phase, you gather together everything you know about your current situation - you examine the business, the customers, the competition and your previous promotional activities. You then analyze what you want to accomplish going forward. Do you want to increase your website traffic? Why? What do you think that will do for you? The point of this process is to be objective, to take a step back and look at the bigger picture. Gather reliable information about your business and marketing activities and define what, exactly, “results” means to you. This entire process is helpful for setting you on course. Many companies produce content with only a vague notion of what they expect it to do for them - that’s like jumping into a random car, in a foreign country, and driving off without bothering to check your fuel level or map. Each piece of content you create should have a purpose. It can be as simple as getting the reader to engage with another piece of content, or maybe you want to increase your visibility for a certain term in the search engine results. Whatever it may be, when you clarify your purpose, you can optimize your content, track the results and learn from its performance. Aligning the goals of your content with those of your business - This empowers you to identify and track the metrics that matter, so that you can demonstrate how your content is contributing to the success and growth of your core metrics. Ensuring you know “why” you are producing content - For example, why are you creating a particular piece of content? Which goal will it help you achieve? Does it answer a question for your target audience? Will it help your reader decide how to perform a certain task? And why is that important? You don’t have to wait until you finish your content marketing strategy to put these ideas to work - start setting relevant goals and asking questions right away. A critical component of any content marketing strategy is the buyer persona. 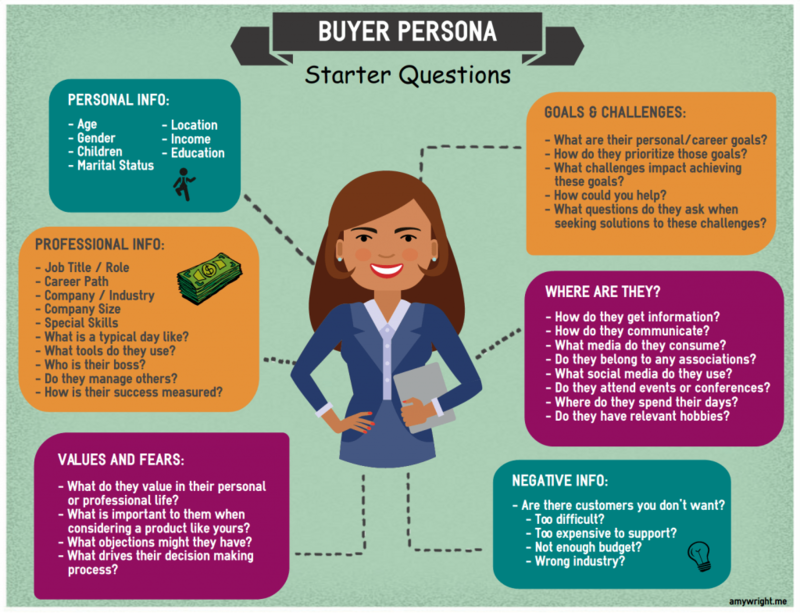 A buyer persona is a research-based profile which depicts a target customer. Businesses use buyer personas to gain a better understanding of their ideal customers, so they can then communicate with them more effectively. Businesses often create several buyer personas to represent different target customers - for example, if you sell software B2B, you might create a persona that represents the ultimate user of the software and another to represent their boss (who will approve the purchase). Both people impact the decision, but they have different criteria for evaluating the purchase, and you need to address their unique needs. Building a buyer persona requires that you think deeply about your customers. Your customers are like the engine for your car - you won’t get anywhere without them - so tailor your content to meet their every need. You need to know who your customers are, what are their days like, the media they consume, the problems they face and the concerns that impact their decisions. This will help you develop empathy for your customers, so you can then create content that connects with them on their terms, using language that resonates with them. Here’s a list of starter questions to give you an idea of what I mean. Informing your brand voice and tone - This will enable you to communicate in a way that resonates with your target audience, and allows you to build rapport. Helping you identify the next logical step in your journey - Buyer personas clarify the topics you need to address, the formats you should use (blog posts, videos, podcasts, etc.) and where your customers are most likely to discover your content. Improving your ability to create and edit content - When you build a buyer persona, you gain a better understanding of what your customers need and how you can deliver it. Clarifying the types of content your customers prefer - You can then audit your existing content and spot gaps. Building a buyer persona is illuminating - it sparks discussions and helps you gain a clearer view of your target audience. Buyer personas are another component of the content marketing strategy that can impact your results right away, they help you gain the empathy you need to craft useful content that resonates with your target customers and encourages them to take action. The word “audit” may sound insanely dull, but don’t let that fool you - content audits can be a goldmine. An effective audit will help you unearth a wide range of opportunities for improving your content and processes, so you can turn your content into a lead generation machine. The trick is to choose the right kind of content audit so you can focus on extracting information that will help you reach your goals. If you’ve been creating content for years, but don’t have a firm grasp on how much you have, where it lives or who should be responsible for creating and maintaining it, building a content inventory (or quantitative audit) is the first logical step. This will enable you to organize your content assets, and determine what needs to happen next. If you already have a content inventory, and believe you have a quality, targeting, competitive or SEO problem, you'll approach your audit through a different lens. For example, if one of your goals is to grow your organic search traffic for a certain topic you may decide to audit content that targets that topic but isn’t ranking well. If you examine that content and find it lacking (in comparison to the competition) you can add it to your editorial calendar and give it new life by improving, republishing and promoting it. Optimizing your content in this manner can produce results within a few weeks - better content can lower your bounce rate, attract more backlinks and improve your position in the search results. Find content that's already attracting website traffic or ranking well in search - Examine it to determine what’s working, then look for ways to optimize it so you can keep your competitive advantage. Identify the content your customers will need as they move through the buyer’s journey - Then audit your content to determine what you’re missing so you can prioritize its creation. Providing your customers with everything they need to make a decision will improve your ability to drive conversions. Audit your blog content to find articles that address a common topic - You may find that you can repurpose this content into a comprehensive guide to generate leads. You can gain a tremendous amount of knowledge from a content audit - but don’t it that overwhelm you. Content audits are like getting an oil change and a tire rotation, they enable you to optimize your existing content so it works harder, and improves your ability to drive results. But it all depends on what you decide to learn and how you apply that knowledge to the next stage of your journey. When Can You Expect Results from Your Content Marketing Strategy? We’ve already established that content marketing is a journey - but you'll never get to your destination if your vehicle is out of fuel and you don’t know where you’re going. Every step of building a content marketing strategy helps to get you closer to producing results, and part of the process is defining what “results” means to you. When you gain this clarity, it’s much easier to evaluate the content and systems you already have in place, so you can then decide what you need to do next. Content marketing is a lot of work, but you don’t have to do it all at once, nor do you have to wait until you’ve finished your content marketing strategy to start applying what you learn. Choose one thing to get started on today - it can be as simple as a blog post that targets one of your newly created buyer personas. Write down how this blog post will help you reach your goals and the metrics you'll track to demonstrate your progress, then build it and let it fly while you continue working on your strategy.